Cryptocurrency prices slid again over the past week, with bitcoin dropping from $6,800 to $6,150, for a loss of around 10%. 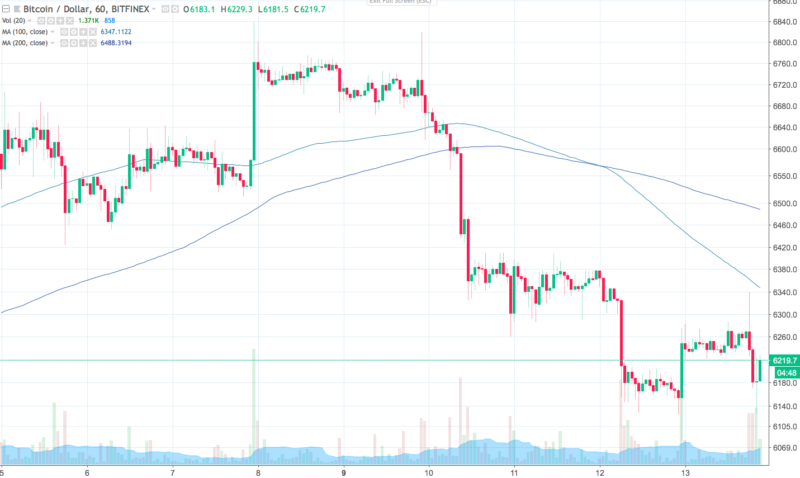 Bulls would like to see the price hold above $6,000 on this dip and then establish a higher low versus the previous day. The overall trend remains to the downside. If support around $6,150 fails, the price has stronger support at $5,800, where you can see a clear double bottom that occurred during June. 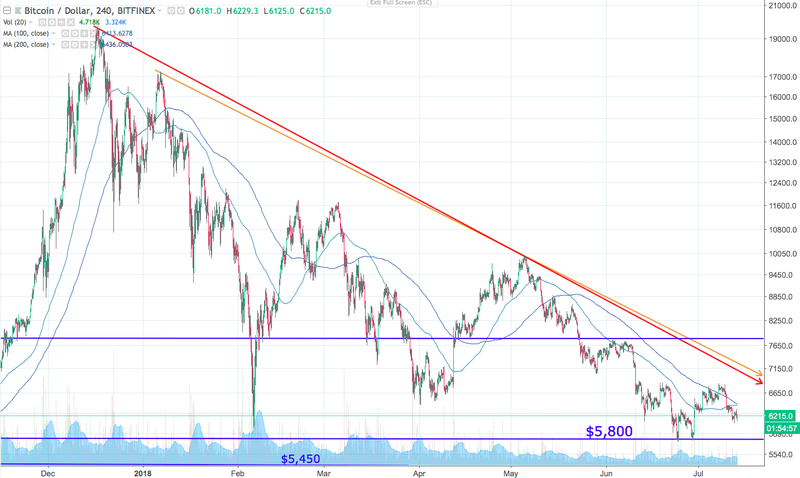 Note that the red and orange downtrend lines are getting closer to the $5,800 support level. As those lines converge, we can expect a major breakout in the price. I am a long-term holder and believer in the technology, its use cases and the inevitable increase in adoption. It is clear to me that it is a better form of money than fiat paper or centralized banker credit. It even has some advantages over gold and the launch of multiple gold-backed cryptocurrencies present the best of both worlds. So, I don’t mind the short-term volatility too much and simply add in small tranches on the dips. But the crypto market has been acting very irrational lately. It has continued lower despite incredibly bullish news and positive catalysts that should be pushing prices much higher. I think all of this bullish news will act as fuel for the eventual fire that lights under crypto prices and pushes them to new highs. The more it falls on positive news, the more powerful the eventual breakout will be. One of the biggest news items last month was the SEC saying that it does not view Ethereum (or Bitcoin) as a security. I’ve always viewed regulatory risk as the biggest threat to the market, so this news was incredibly bullish in my view. More recently, South Korean cryptocurrency exchanges passed regulatory tests. Korea is a very important market to the crypto space and this announcement lends legitimacy, reduces risk and will lead to increased adoption in Korea. Adding to the good news, it appears that the Indian government is not going to put a blanket ban on digital currencies, but rather treat them as commodities, an anonymous source in the government said. India is a nation of over 1.3 billion people and cryptocurrency is becoming very popular to citizens there. The SEC announced in late June that they were working on an outline for newer (and less-restrictive) legislation regarding open-ended and low-risk ETFs to increase innovation in the financial space. This could potentially boost the chances of ventures seeking to establish bitcoin ETFs. There have been a few attempts at launching a crypto ETF, but they have failed. The SEC said it was not accepting new applications and optimism over the approval of a bitcoin ETF waned. But just this past week, the SEC announced they are examining an application from the Chicago Board Options Exchange (CBOE) Global Markets for a coveted bitcoin ETF license. This is a major shift from the SEC and opens the doors to an ETF that could bring new waves of institutional investors into the bitcoin arena. The process began in June 2018, when the SEC recently sought comments from industry professionals regarding the ETF in question, which is being offered through the VanEck SolidX Bitcoin Trust – a joint venture between financial firms VanEck and SolidX. The application is the Trust’s third attempt to garner any such license; the first two attempts were rejected in early 2017. Remember, the CBOE was first to launch bitcoin futures trading. 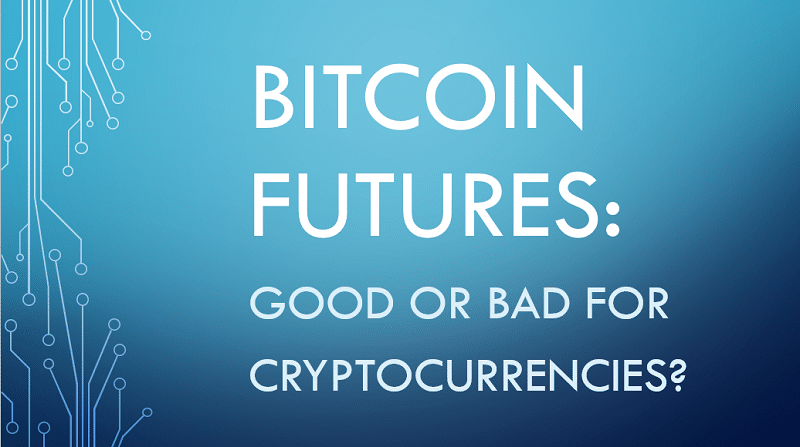 But unlike futures trading, the ETFs would actually back their shares with bitcoin. This will add increased demand for the limited supply of bitcoin in circulation and likely push the price much higher. This is precisely what occurred following the launch of the first gold-backed ETF. Speaking of institutional money flowing into the crypto space, Coinbase announced that their custodial solution for investitutional investors officially launched at the start of July. Coinbase Custody addresses the security concern of institutional investors, as it is secured through an SEC-compliant and FINRA-member independent broker-dealer, Electronic Transaction Clearing (ETC). Coinbase plans to “unlock $10 billion of institutional investor money sitting on the sideline.” The exchange is in fact attempting to become a fully SEC-regulated broker dealer itself via its recent acquisition of a financial services firm, as well as pursuing its own federal banking license. During June, Coinbase’s Index Fund opened to large-scale “accredited” investors for investments of between $250,000 and $20 million. 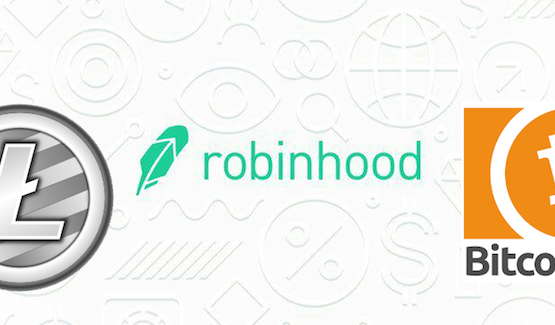 Robinhood’s zero-free trading platform added Litecoin and Bitcoin Cash to their crypto trading app last week. In additiona, the Opera web browser for Android is launching a private beta version that will include a built-in cryptocurrency wallet. Just a few weeks ago, New York’s Department of Financial Services granted Square a virtual currency license, allowing users of the Cash app in the state to trade bitcoin. Cash has over 7 million monthly active users, the company said in its first quarter earnings call. The world’s second largest crypto exchange, Binance, is backing plans to create a blockchain-based bank with tokenized ownership. This would be the world’s first decentralized bank, dubbed “Founders Bank.” The company certainly has the funds to pull this off, as they expect profits to reach $1 billion in 2018, CEO Changpeng Zhao said. Sirin Labs, a Swiss-based smartphone developer, will release a blockchain-based phone in November of this year. The smart phone features a dual-screen set-up with a second display entirely for cryptocurrency transactions. The Safe Screen slides up from the rear of the device, and runs on dedicated firmware that allows users to be sure of where their transaction is taking place. Activating the slider also launches the Finney’s cold storage wallet, which supports multiple cryptocurrencies. Meanwhile, cryptocurrency and blockchain companies are attracting top-tier talent from well-known firms. Ripple hired Facebook’s former Global Director of Financial Services Payment Partnerships to develop global payment systems. Cryptocurrency exchange Gemini, founded by the Winklevoss twins, announced that former Chief Information Officer of the New York Stock Exchange (NYSE) Robert Cornish has joined the company. Even the top tech execs are showing serious interest in cryptocurrency. Google’s co-founder Sergey Brin made the surprise revelation that he is an Ethereum miner at the Blockchain Summit in Morocco. The flood of good news in the crypto space throughout 2018 has done little to stop the sharp correction in prices. It doesn’t make much sense, but for long-term holders it only strengthens our resolve to see the space developing. So long as you keep the long-term view, only invest funds that you can afford to lose and don’t let emotions rule your investing, the future looks bright. We are overdue for a major rally in this sector and I believe we are likely to see new highs for bitcoin, ethereum and other leading cryptocurrencies by the end of the year. If I am correct, we will look back at this current correction as the last great buying opportunity in this space. Follow all of our cryptocurrency research, get our top picks, ICO research, plus coverage of mining stocks and cannabis stocks, by subscribing here.